NASA's Phase VI astronaut glove is displayed in this view. Six teamsfrom across the country are converging on Connecticut this week to determinewhich among them has built a better space glove in a NASA-sponsoredcompetition. The two-daycompetition, billed as the Astronaut Glove Challenge, begins May 2 at the NewEngland Air Museum at the Bradley International Airport in Windsor Locks, wherea total of $250,000 in prize money is at stake. The contest is one of severalcompetitions under NASA'sCentennial Challenges program which offer cash prizes to spur innovation andinterest in spaceflight technology. "We'relooking for something different, to show us something unique," said Alan Hayes,CEO of the non-profit Owings, Maryland firm Volanz Aerospace, which isoverseeing the Astronaut Glove Challenge for NASA. Spacesuitgloves are among the most important components of an astronaut's spacesuit,especially during hours-long spacewalks to perform construction or maintenanceoutside a vehicle such as the International Space Station (ISS). Astronautshave endured cold fingertips and broken fingernails, as well as bruised andbleeding hands, to overcome the resistance of their pressurized spacesuitgloves while working long hours in space, NASA said in a statement. "Spacesuitdesign has a way to go and we're starting with the glove, which is probablygoing to have the biggest impact on the astronauts," Hayes told SPACE.com. NASA'sAstronaut Glove Challenge offers a $200,000 prize for the team that presentsthe best astronaut glove that surpasses the minimum requirements set by NASA'sbaseline Phase VI glove. A separate, $50,000 award is reserved for theMechanical Counter Pressure glove joint demonstration that compares glovedexterity and flexibility. Towin the challenge, competitors must supply two different astronaut gloves to beused in three separate tests, NASA has said. First,each glove will be measured to determine the amount of force required to moveits fingers and thumb. The glove with the least force wins the most points. Then,each team will use one of the gloves to perform dexterity tasks within adepressurized glove box. The more tasks completed within a specified time winsmore points. Finally, one glove from each team will be subjected to a bursttest to determine how much internal pressure they can withstand. Theteam that wins the most points while exceeding the performance of NASA'scurrent spacesuit gloves will win the Astronaut Glove Challenge. Competitorsare not required to provide their own thermal or micrometeorite garment, whichwrap around the outer layers of NASA's current spacesuit gloves for addedprotection against the space environment. It was that outer glove layer thatsuffered a thin slice about three-fourths of an inch (about two centimeters)long to its palm during one of fourspacewalks performed by veteran astronaut Robert Curbeam as part of NASA'slast shuttle flight in December. Engineers had to use a microscrope to ensure that the glove was in fact damaged and not weathered by normal wear and tear, NASAspokesperson Brandi Dean told SPACE.com. The AstronautGlove Challenge is the fourth NASA contest to be performed. Theagency's BeamPower and Tether challenges, in which entrants construct light-poweredclimbing robots and strong tethers, met in 2005 and 2006, yielding no winnersdespite a prize purse of $200,000 per event last year. The Northrop Grumman LunarLander Challenge, which offered a $2 million prize for privatelybuilt vehicles capable of vertical takeoffs, landing and in-flight hovering,met in October 2006 at the Wirefly XPrize Cup and also ended without a champion. Anothercompetition, the 2007 Regolith Excavation Challenge, calls on entrants to buildtheir own autonomous Moon dirt digging robots. The first meet for that contest,with $250,000 in prize money up for grabs, is scheduled for May 12 in SantaMaria, California. 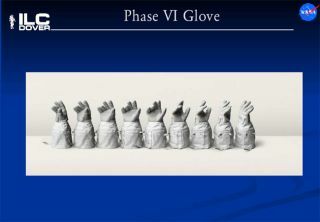 Hayes saidthe space glove contest would go on even if none of its six competitors make itthrough the qualifying stage. "Everybodycould fail on Day One, but we're still going to go through with thecompetition," Hayes said. "I'd love to be able to give out a $250,000 check onThursday."